The Super Bowl is usually associated with large sums of money. Let’s face it, with the perfect combination of high-paid professional athletes, multi-million dollar ads and millions of TVs tuned to the game, it’s hard not to think of the cost. But believe it or not, there are plenty of ways you can use the Super Bowl to save a few bucks this year. Heating. If you’re throwing a Super Bowl party this year, you can expect to score some savings on your electricity bill. Extra people in your home create warmth, so you can turn down your heater and save on energy. Food. Instead of buying all the food and beverages yourself, ask your friends and family to bring over their favorite Super Bowl foods. That way you don’t have to cook or spend as much money feeding your party attendees. Friends. The ultimate money-saving Super Bowl strategy is to simply go somewhere else to watch the game. 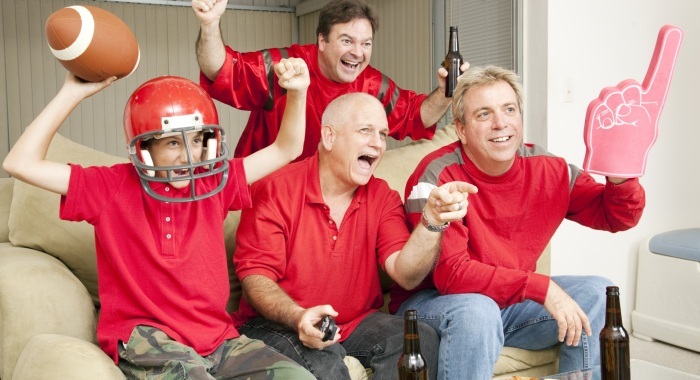 If you attend a party at a friend’s house, you don’t have to cook, clean or pay for the electricity used during the big game. Coupons. Even if you’re not having a party or don’t plan to make anything, the Super Bowl is an excellent time to stock up on chips, sodas and other snack foods. Most grocery store chains offer special prices or coupons on food to drive sales during the nation’s favorite football game. With careful planning, you can capitalize on the savings. Promotions. Food retailers are quickly jumping on the Super Bowl bandwagon too, offering special promotions to market their products. Companies such as PepsiCo, Pizza Hut and Dannon Oikos are planning Super Bowl events in New York and New Jersey where they will hand out products for free. TV discounts. Special Super Bowl pricing extends beyond your favorite grocery store. If you’re in the market for a new TV you can probably find some great deals for the game. But if you can wait even longer, you might find even better offers after the Super Bowl. At the end of February new TV models make their way into stores so you may be able to get last year’s model at a bargain. And if you want to continue saving over the life of your TV, choose an energy-efficient television. Recycling. The Super Bowl is basically a holiday in the United States. And you know what that means: Overconsumption. Fortunately, you can take advantage of all the excess through recycling. Most recycling centers offer cash for aluminum beer or soda cans, so you might be able to make a few bucks if you ask everyone to save their cans.